The Packers will miss the playoffs for the second consecutive year and we fans aren’t over it. To add insult to injury, last week I researched ticket prices to Soldier Field up until game day. My husband and I were debating whether or not to go and make a weekend out of it. When ticket prices failed to dip below $170 each we decided not to make the trip. Like Bears fans who aren’t going to let me forget this season, my phone hasn’t forgotten my search history, and I’ve experienced constant Bears playoff ticket pop-ups and other Bears related internet suggestions that I’m not interested in this week thus far or ever. And while I’m not thrilled that it came in the 4th quarter of the same game versus the Bears of which the Packers were eliminated from the playoffs I’m happy that the record for consecutive pass attempts without an interception ended at 402 for Aaron Rodgers. I never liked that statistic. What I remain interested in and still love is Green Bay Packers football. Reminding myself that it’s going to be approximately 250 consecutive days following the end of the season I’m committed to making the best of whats left of it. I’m looking forward to the next two regular season games and will be mixing up my routine, everything except calling my Dad before kickoff. This week I may host a Packer party or meet a group of friends at a bar to watch the game, both experiences I would’ve never considered but for the Packers not making the playoffs. Superstitions are out the window; seize the opportunity to have a different experience and throw your lucky Packers socks in the wash.
Or better yet the trash; ask for a new pair from Santa. 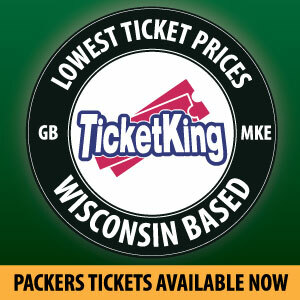 The following week I may take the trip to Green Bay early. 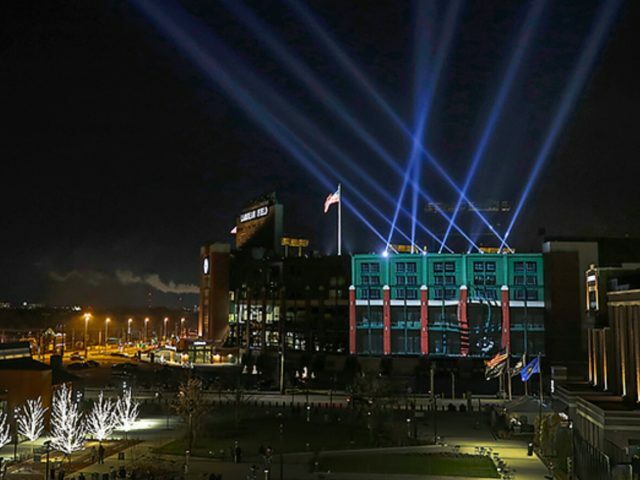 Spend the money I saved by not going to Chicago, and be there Saturday night to attend the Winter Jubilee: Light Show at Titletown which is a 7 minute uninterrupted light show on Lambeau’s outer west facade which plays most Thursdays, Fridays, and Saturdays until December 31, starting on the hour and half hour. Instead of hosting a tailgate I might walk around with a cold one to soak all that is game-day in Green Bay. 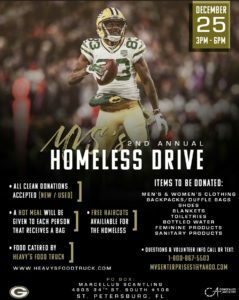 A 13x World Champion vibe always, for the second consecutive year Packers wide receiver Marquez Valdes-Scantling is organizing, together with his family in St. Petersburg, Florida, a Christmas Day homeless drive. Via Amazon, I had a blanket shipped to the address listed, and monetary donations can be made to www.uncommontouch.org/mvs. Green and Gold Till I’m Dead and Cold. This entry was posted in Packers 2018-2019 Season, Sarah Szejn, Uncategorized and tagged 02 onseutive pass attempts, Aaron Rodgers, Bears, Christmas Day, Green Bay Packers, Lambeau, Light Show, Maruez Valdes-Scantling, Playoffs, Soldier Field, Titletown, Winter Jubilee. Bookmark the permalink.